The Dark Faerie: Cupcake success!!!!! Well...the four dozen cupcakes turned out faboo!!! There was not a cupcake in sight once the baby shower was over! I made the cookies 'n cream, vanilla with raspberry buttercream (also added a dollop of raspberry preserves into each cupcake before baking for a fruit center), carrot cake with cream cheese icing and coconut heaven. All were from VCTOTW except the coconut which were from Vegan with a Vengeance. I thought I would stress out with so many cupcakes....but it was actually quite fun. 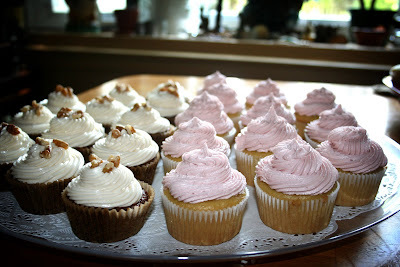 I baked them the night before, made the icing the next morning - let chill, then iced the lovlies in the afternoon. I only wished there had been extras to sample...but we did have fun licking the icing bowls!!! :O they're so beautiful! I especially want one of those cookies'n'cream! Mmm, they all look so delicious!